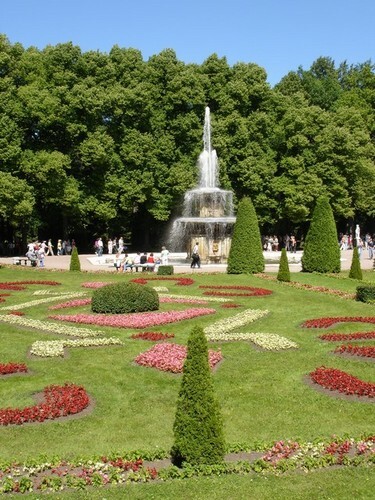 st petersburg isnt just famous for its canals and the outside of its buildings. it’s also really famous for having some incredible museums. 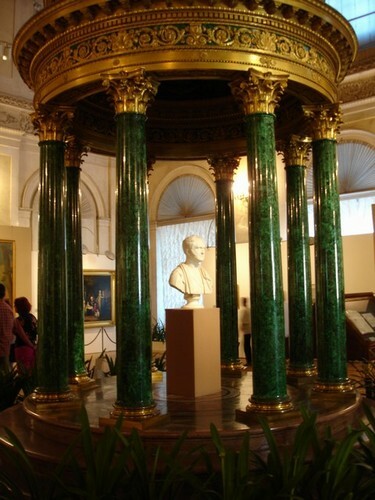 on our second and third day in the city, we went to the russian museum and the hermitage. 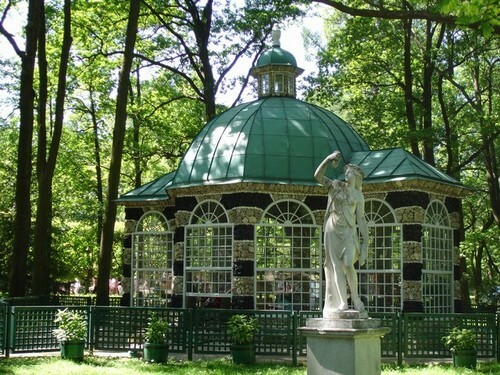 the hermitage is one of the most famous museums in the world. it has so much art (3 *million* pieces), that not all of it can even be displayed at once. the museum is made up of 4 buildings, some of them w/ 3 stories. it’s practically a maze of artwork. there’s art from so many different countries and time periods… absolutely impossible to see it all. we just tried to check out the “highlights” mentioned in the book, but didnt have enough time for even just that!! 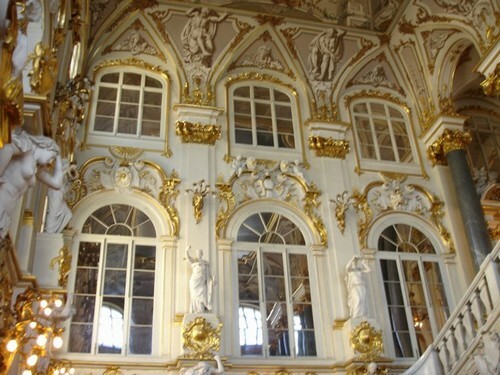 the most impressive thing about the hermitage though, is not just the art that’s inside it, but the building itself. 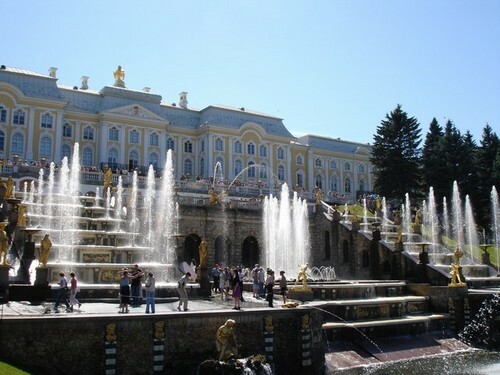 the building is an old palace that used to be used by the tsars. you walk through it and it’s impossible not to be in total awe of the splendor around you. every room is decorated differently. 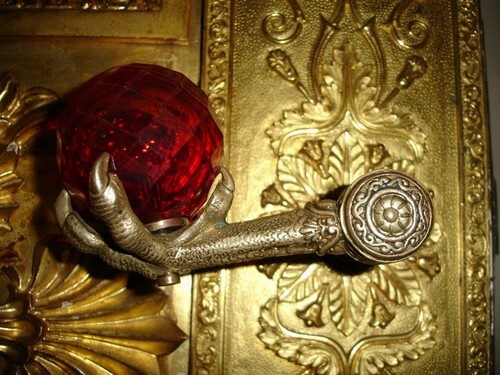 marble everywhere, huge slabs of shiny green malachite, shimmering chandeliers, huge vases, and fancy doorways. 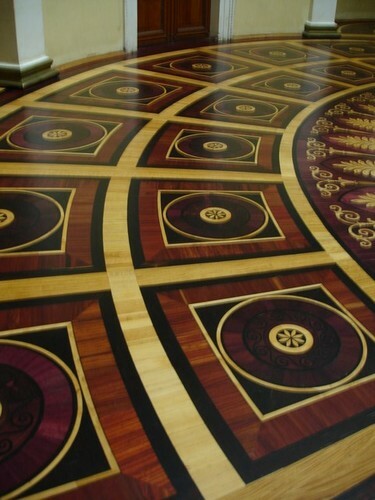 the floors and ceilings in each room are decorated in a different motif and color scheme. each room you walk into is more impressive than the last. really, it’s possible to walk through the place and not even bother paying attention to the actual art. 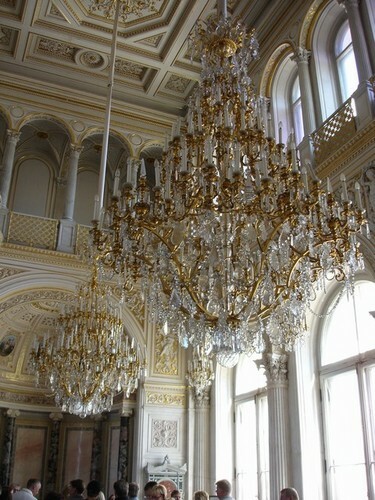 the russian museum, although maybe not as spectacular as the hermitage, is also impressive. 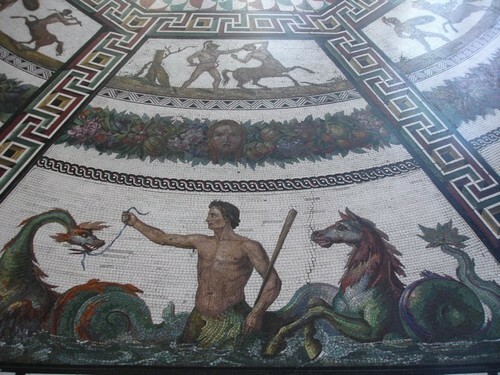 it’s also decorated rather fancily inside, and has a huge amount of art. during our first visit to the russian museum, we rushed through as fast as we could to see as much as possible. it turned out that we missed seeing the special temporary exhibit they had on chagall. so, a few days later, my dad’s friend boris, took us back there and showed us the exhibit. he knew a ton about chagall and spent time explaining the artist’s life to us, and showing us a lot of the thoughts behind his works. also, a couple days later, he took us back to the hermitage as well. he showed us around the ancient greek, roman, and egyptian section. even just this one tiny section of the museum was huge and packed full of stuff. luckily, boris spent a lot of time explaining to us how the work was done and taught us a lot about the history behind it all. we were *so* lucky to have him there with us. if he hadnt been there, it weould have just been a huge jumble of pottery and statues, and we would have just glanced at it all, completely not knowing anyting. i swear, you get so much more out of a museum if you go w/ a knowledgable person! so, in the end, we went oto both the russian museum and the hermitage *twice* and yet still didnt get to see even close to all the stuff each has to offer. art overload! 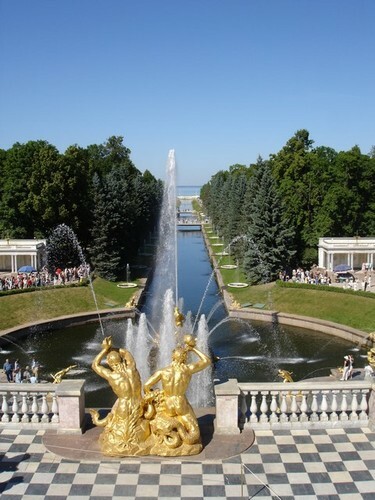 on one of our days in st petersburg, we decided to take a day trip to petrodvoretz. 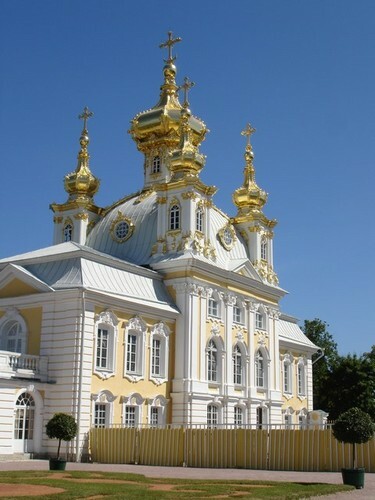 this is a palace outside of town where peter the great (founder of st petersburg) used to live. *wow*. this place was so impressive. the palace was huge, and was designed by rostrelli, a very famous architect who designed a lot of the famous buildings of st petrersburg. the building itself was beautiful both inside and out, and also had huge gardens surrounding it. 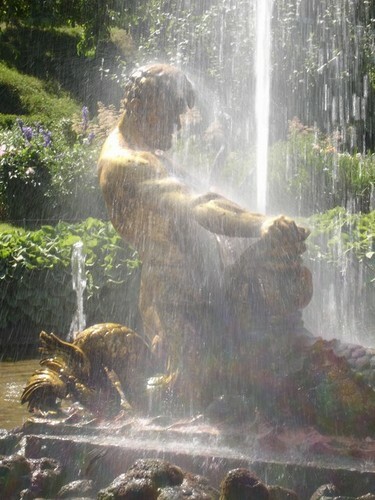 the gardens are really famous for having tons and tons of fountains. 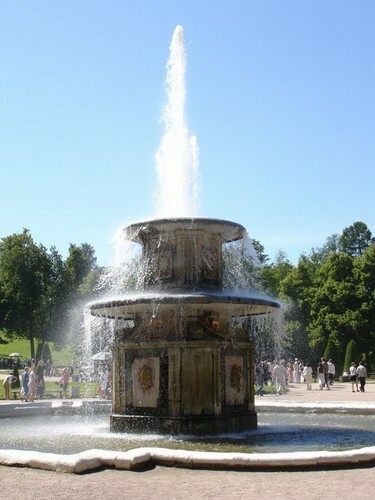 there are fountains in all different shapes and sizes. also, there are some “trick” fountains too that spray people randomly when they arent aware. 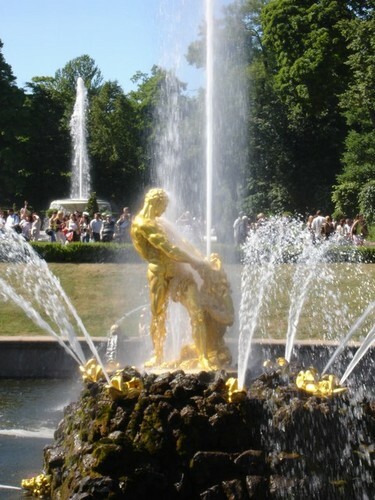 there’s also some fountains for the little kids to run around in as well. the grounds are huge and you can spend a ton of time just wandering about and enjoying the place. I took 3-4 rolls of film of that huge fountain. I was pretty much in complete awe of it the whole time we were there. All I can say is WOW Vlad! 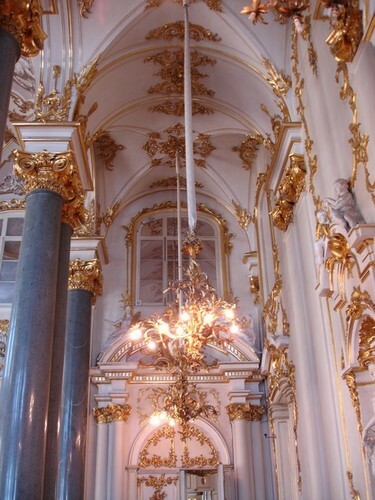 The beauty of St Petersburg has me speechless. Your photos of St Petersburg are outstanding, absolutely beautiful. Everything has a lot of gingerbread!!! Oh, by the way…..THANK YOU FOR SHARING! Did you see the squirrels?? yeah, the fountains are so damn cool. it’s funny cause i’ve already seen all this stuff before. just a few years back, and yet it’s still just as cool the second time! yeah, it really is a dazzling place! so much to see! yeah, i really lke the gingerbread houses. especialy the colorful shutters and doors. i really couldnt get enough of them! heh, no. no squirrels this time unfortunately. tried to deman a refund since the squirrels are the best part right? yeah, i still think yo should go. just be sue to do *everything* by the book, and dont expect it to be easy. not being able to speak russian (or read cyrillic) will be a bit rough, but by all means, go for it. it really is a beautiful country despite all the hardships!